This is an old Japanese towel rack, sometimes called a children’s kimono stand. The metal work is in traditional style and the mounts have been used on many different kinds of lacquer pieces throughout the Edo period. 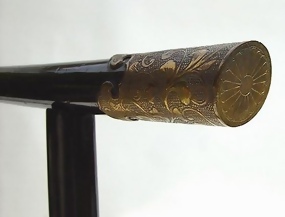 The chrysanthemum mons (family crests) on each end of the mount, were used by the Emperor, royal princes and others outside the Imperial family, in a variety of forms. Although the 16 petal mon was designated for use by the Imperial family, others were entitled to use it. For example, the people of Totsugawa were given it as a mon for loyalty to the Emperor in 1863. The chrysanthemums on this stand have 18 petals. It was only in 1869 that the government reserved by law the use of the chrysanthemum mon for the Imperial household. This stand is not only beautiful but very solid without the support of the pegs provided at the bottom. The quality of the lacquer work shows with all the dents and some chips at the bottom (shown in the pictures) of many years. The dimensions are 19 3/4" tall, 24" wide at the top, 19 1/2" wide at the bottom and 7 5/8" deep.